Patricia Cook Director is the director of the Des Moines U.S. Export Assistance Center. 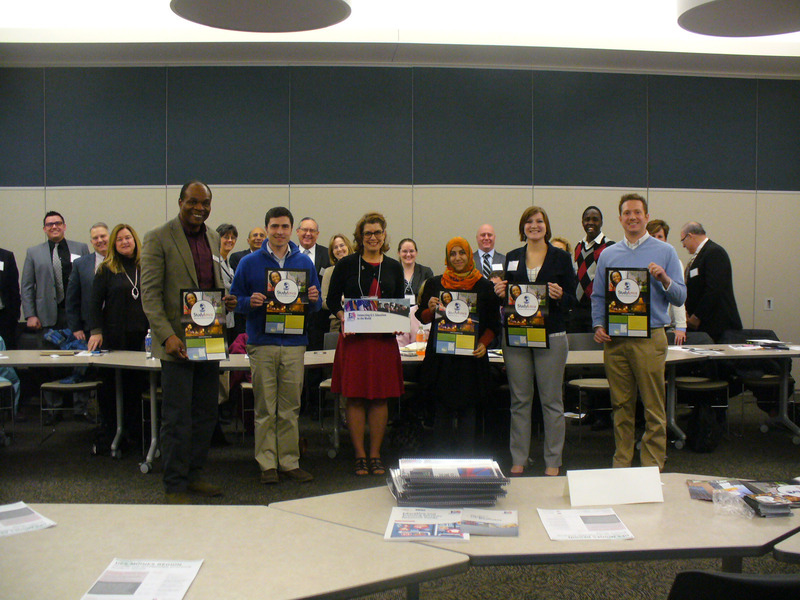 International Education Event – bringing together Iowa’s International Educators. Did you know the fastest-growing export sectors in Des Moines, Iowa are financial services, international education, biotechnology, and value-added foods? These results were reported in a Brookings Institution study highlighting the results of the city’s first year as part of the Metropolitan Export Initiative (MEI). The Des Moines region was among the first U.S. metro areas selected to participate in the MEI, which was launched as a partnership between the International Trade Administration and Brookings. The initiative’s goal is to explore and analyze local market export data. The project brought together public and private sector partners to talk about what is working in Central Iowa and what opportunities are being missed. The U.S. Commercial Service served on the Steering Committee along with the State of Iowa International Trade Office, The Greater Des Moines Partnership (the project host), the City of Des Moines Mayor and County Supervisors, International Traders of Iowa, Iowa DEC members, SBA, SBDC, and interested members of the trade services community. Since 2013, the Greater Des Moines Partnership has continued the work begun during the MEI by establishing an International Committee, with many of the MEI members plus a few more interested parties. This group manages how the MEI report directives are tied to actual progress in the business community. In April 2014, the region was branded under the umbrella theme of “Cultivation Corridor”; this will be the marketing framework for the biotechnology and foods segments. Regarding the services sectors, these will remain deserving of a special focus. The analysis showed that while most of the United States has around 30 percent of its international activity tied to services, the Des Moines region has an unusually high proportion of activity, 40 percent, in the business service sectors. As a result of the MEI, Iowa now hosts an annual Global Insurance Symposium, which is well attended by global financial services and insurance industry representatives with presentations promoting international business expansion, as well as foreign direct investment. But what about activities in the space of international education? While the StudyIowa Education Consortium was already an established group representing both rural and urban schools and education services, there was nothing underway to connect that statewide group to the MEI’s International Committee. As Director of the Des Moines US Export Assistance Center I came up with an idea to host a meeting that would introduce the significant players in international education in Iowa. This very successful event kicked off efforts to boost international education as a business sector here in Iowa. Forty enthusiastic representatives of businesses, government, rural and urban colleges, education sector business owners, and other public leaders attended the event. The U.S. Commercial Service, Des Moines U.S. Export Assistance Center, has successfully introduced the Greater Des Moines Partnership to StudyIowa; to the Iowa DEC; to International Traders of Iowa; to State of Iowa International Trade Office; and to the Iowa Global Health Consortium. Future project goals, alongside the International Council objectives, are to connect international students with the internship programs of the Des Moines region, lobby work for visa and immigration reform to allow international students to remain in Iowa to fill highly skilled positions, and to establish an improved referral network of students to the regional businesses which are eager to hire the graduates of local community colleges, private colleges, and public universities.